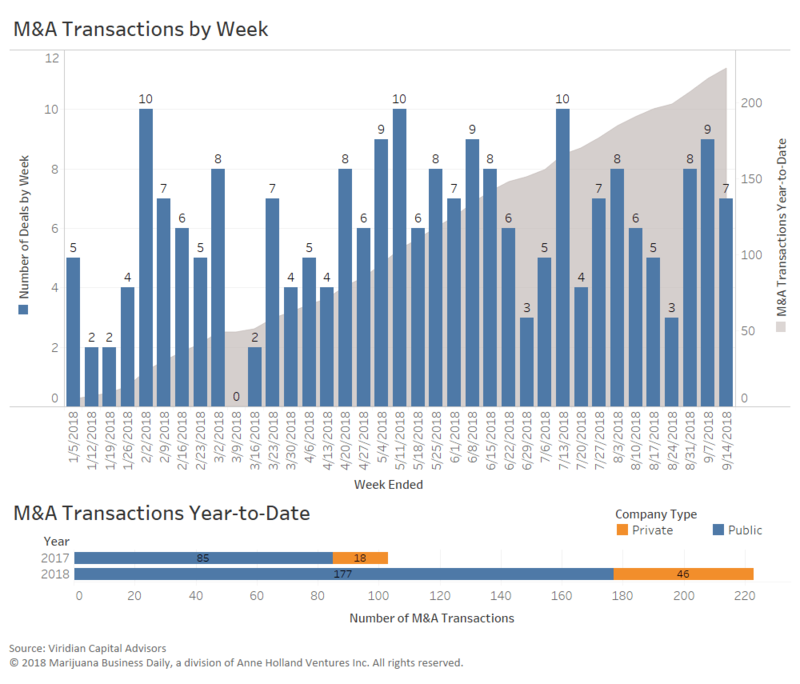 The data below, provided by Viridian Capital Advisors, is through the week ended Sept. 14, 2018. 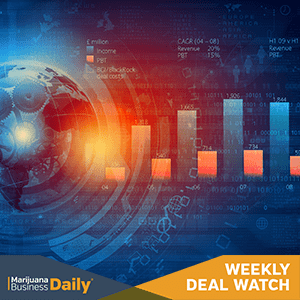 Khiron Life Sciences raised 12.9 million Canadian dollars ($9.9 million) to expand its Colombian operations, a signal that investors are interested in firms well positioned for low-cost cannabis production. “It is widely thought that Columbia, Uruguay and other countries in that region – because of the optimal growing conditions – will become the lowest-cost producers of cannabis in the world,” Greiper said. Hyasynth Biologicals raised CA$5 million from Canadian licensed cannabis producer Organigram to scale up its patent-pending process for cannabinoid production from yeast. The deal is another strong indicator of interest in low-cost CBD preparations. “It’s really become a race with science rather than how many plants you get into the ground,” Greiper said. 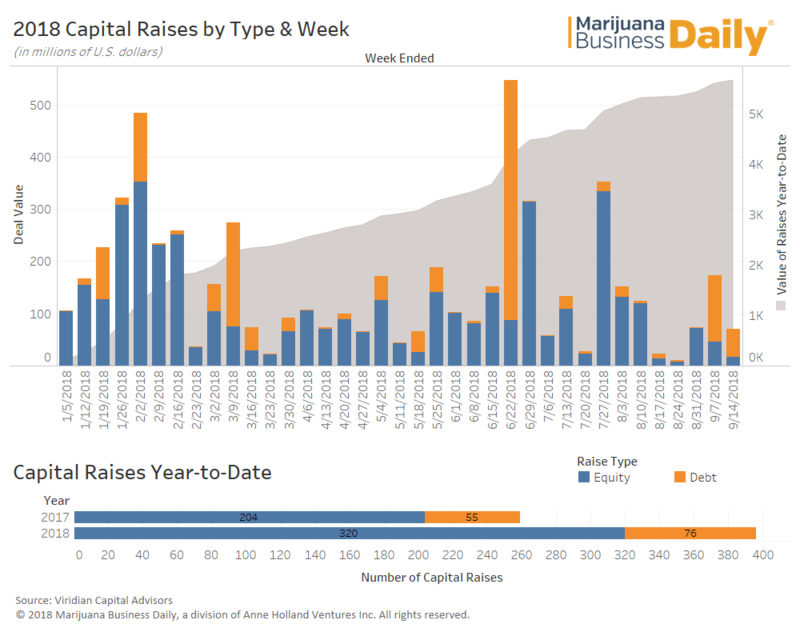 Investment group Captor Capital acquired California marijuana companies Mellow Extracts and Chai Cannabis – a signal of increased investment activity into MJ brands and infused products. “Cannabis is really starting to segment itself as a consumer products market, but brands in this industry remain so fragmented,” Greiper said. “There is no major brand – no Coca-Cola or Marlboro or Grey Goose at this point, which is a huge opportunity.” Watch for more interest in acquiring and building brands in this space. Canadian medical cannabis clinic company National Access Cannabis Corp. acquired Canadian adult-use retailer The Green Company. The deal highlights a shift in strategy for medical cannabis clinic operators that are working to transition into Canada’s upcoming adult-use market by expanding into the licensed retail segment. Going forward, when you mention the name of a specific company, please provide the stock symbol if it’s a publicly-traded company. please include the ticker symbol when you mention a publicly traded company.